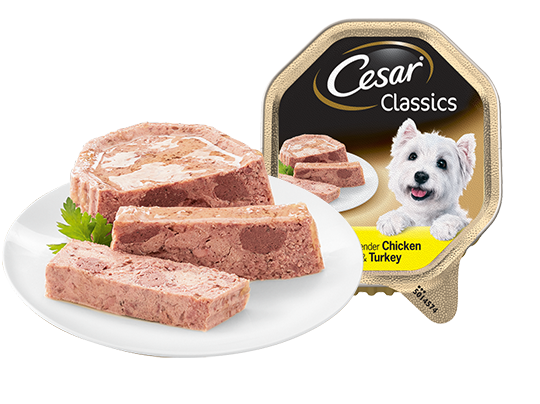 CESAR Classics Dog Tray with Chicken and Turkey 150g is rated3.0 out of5 by2. Rated 5 out of5 byMagz1954 from2 Delicious FlavoursI have a very fussy dog of nearly 4 yrs old. From the day I bought him he has refused to eat dog food.Over the last week I have been tempting him to eat dog food but not had much luck, he would eat a little and leave the rest. I bought a tray of Cesar chicken and turkey to try my dog with. He scoffed the lot and licked his plate. He seemed to thoroughly enjoy the texture and taste combination. I think I have finally hit the jackpot of dog food make and flavour. I will try him again tomorrow but if today's showing told me anything it was he is still fussy and he has decided he loves Cesar. Rated 1 out of5 byJane fromBad trayI brought this Tray along with 5 other and opened it and saw it was badly damaged and mouldy. Not great when you have a hungry diabetic dog. A 5 kg dog requires 2 1/2 trays per day, a 7 kg dog 3 trays, a 10 kg dog 4 trays. We recommend to feed a mix of wet and dry food, just have the recommended quantities or respective products. Allow a transition phase and adjust amounts according to your pet's needs. Water should always be available. Serve food at room temperature and surplus food can be refrigerated for up to 2 days.